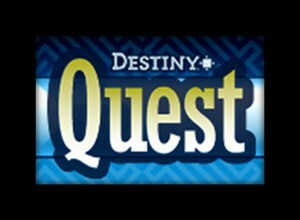 By clicking the Destiny Quest icon below, students, parents, and teachers are able to search our online catalog to see what titles we have available in our library. Books can be searched by keyword, title, author name, or series name. Users will be able to see if the item is currently available or if it is checked out. A red book icon appears in the corner if the book is available in hardback. A small blue "e" icon appears if the title is an online eBook. Ebooks can also be accessed by clicking the eBook tab.